With this Add-on for Super Forms you can password protect your forms from being submitted. You will also be able to hide the form from logged out users, and also from specific user roles. You can also display a message based on these conditions to the user. Click here to read more about this Add-on. 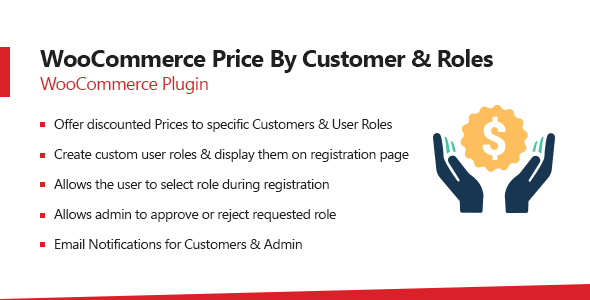 The WooCommerce Role-O-Matic plugin (WCRA) is a powerful tool that allows the shop admin to create “assignment rules” that dinamically assigns role(s) to the customers according to the amounts spent during the configured time periods or according to thepurchased products. This tool can be very useful because can be use togheter with the WooCommerce Pricing! Require selected user roles to change their passwords after a selected time. In the plugin settings you can set the maximum number of days users are allowed to use the same password (100 days by default), as well as which user roles will be required to reset their passwords regularly (by default all except administrators). Features: Hide WordPress admin menu and submenu items; Rename WordPress admin menu and submenu items; Reorder WordPress admin menu and submenu items; Change the icon of WordPress menu and submenu items.